Our newest Halloween Colorway is now in the shop! 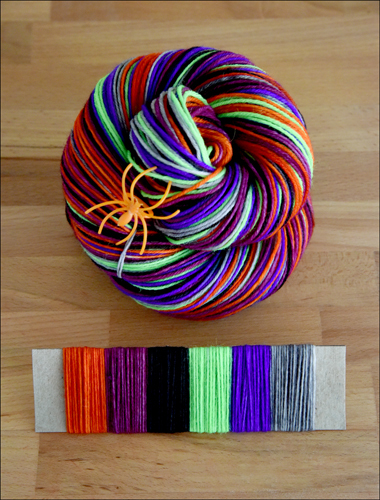 ‘Whisper to a Scream’ is a super festive Halloween inspired 6 different color stripe Vesper Sock Yarn self striping colorway! There are also our favorite Halloween colorways in the shop now, click here to see ALL of our currently available Halloween colorways! I always have SO MANY ideas for Halloween Colorways! I’ll maybe have one or two more before the end of the month, in between filling wholesale orders!